Shish Tawook is a Lebanese chicken dish that’s simple yet so delicious. Tender chicken marinated in yogurt, lemon and garlic makes one delicious meal for the family. 1. Cut the chicken breast into 1 1/2 inch pieces and place them in a large bowl. 2. In another bowl, mix Greek yogurt, olive oil, garlic, lemon juice, tomato paste, paprika, sumac and thyme. 3. Pour the yogurt mixture over chicken pieces and mix well. Cover with a plastic wrap and refrigerate for at least two hours up to eight hours. 4. Heat 2 tablespoons olive oil in a large pan over medium heat. Once the oil is shimmery, place the chicken pieces in the pan but don’t over crowd the pan. 5. Sear the chicken pieces on one side for 3-4 minutes, then stir and sear the other side until the chicken is fully cooked. 6. 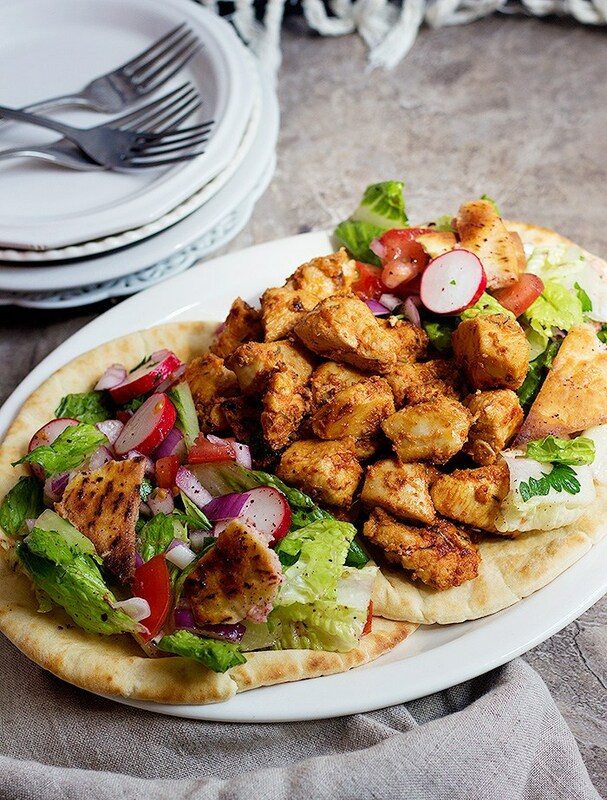 Serve shish tawook with pita and salad. 1. Don’t stir the chicken too much while cooking so you can get a nice sear on all sides. 2. Shish tawook is originally grilled. Thread the chicken pieces onto skewers and grill on medium for about 12-15 minutes until fully cooked. 3. The chicken might start releasing juice while cooking in the pan, stir the chicken a little bit to help it get more flavor. 4. Add a little bit of salt before serving.